Clematis 'Candy Stripe' is an attractive, compact growing variety with large pinkish-lilac flowers with a deep rose-pink stripe and over-lapping petals during May, June and then again in September. This striking non-evergreen climber can be planted in the garden, trained against a trellis, pergola, fence, wall or in a container supported by bamboo canes or an obelisk on your patio. 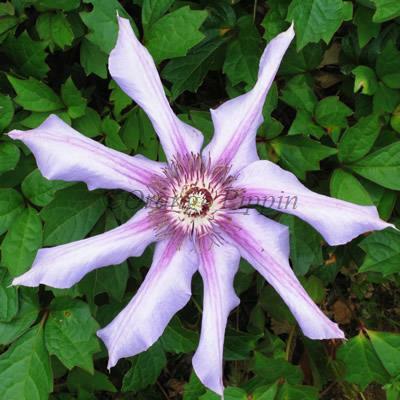 It is said that Clematis 'Candy Stripe' was raised by Frank Watkinson, England.